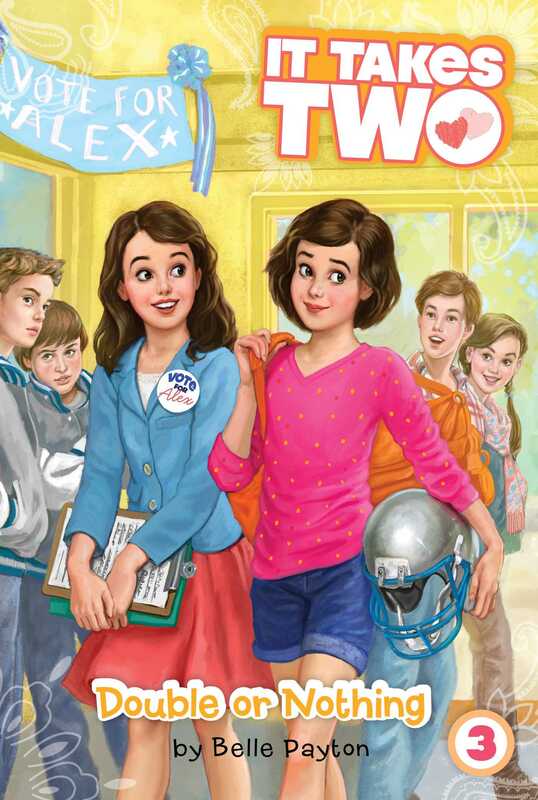 In the third book of the It Takes Two series, Alex runs for class president and Ava tries out for the football team. Can both twins win? It’s school election time, and Alex is determined not to let a small thing like a move across the country stop her from becoming seventh-grade class president! She may be new, but she’s probably the most ambitious candidate Ashland Middle has ever seen…and it does help that she’s the coach’s daughter, so everyone knows who she is. It’s also time for football tryouts, and the boys are more than a little surprised when Ava shows up on the field! She’s a fantastic kicker, but she’s causing quite a bit of controversy as the first girl to want to play football in Ashland…and possibly stirring up trouble for Alex’s campaign. Will Ava’s attempt to follow her dreams cost Alex the presidency, or can Alex use her platform to convince the town that it doesn’t matter if you’re a boy or a girl, as long as you’re serious about football?